Cut each biscuit into 6 pieces. Easiest to cut in half. Place on top of each other. Cut in thirds and then separate. Put aside until all are cut in pieces. In a large bowl, combine all other ingredients together. When combined well, drop biscuits pieces into it and gently toss to get mixed well. Using your hands is a plus here. Preheat oven 350F. Coat bundt pan with cooking spray. Place in bundt pan and spread out evenly. Place bundt pan in oven and bake for 35 – 40 minutes. Keep an eye on them so they don’t over bake on the outside and doughy on the inside. After about 35 minutes, gently pull a piece of bread away to see if it is done or not. If not, bake in 5 minute intervals until finished. 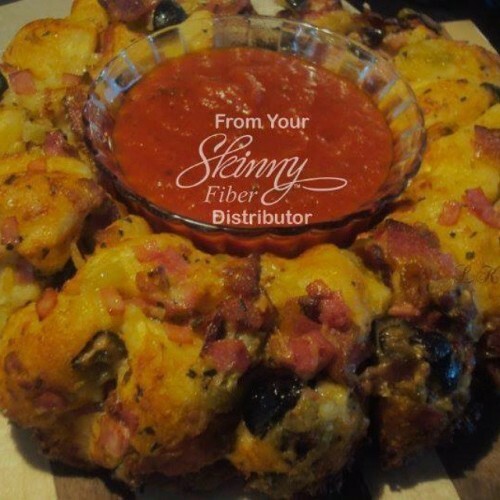 Serve with pizza sauce and enjoy. This entry was posted in Recipes and tagged bacon, bread, sausage, snack on January 13, 2019 by The Yellow Pine Times. Preheat the oven to 400F. Line a large baking tray (with sides) with several sheets of foil, and drizzle with a bit of oil. Spread the oil out over the pan. Set aside. Put the sausage rounds, onions and potatoes into a large bowl. Drizzle with a couple TBS of olive oil and season to taste with salt, pepper, paprika and dried thyme. Toss together with your hands until everything is evenly distributed. Pour this out onto the baking tray, and spread it out as much as you can. Author’s note: I would not use any more than 1/2 tsp of the dried thyme, unless you really, really like the flavour of thyme. 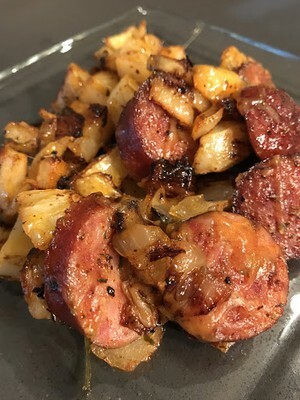 This entry was posted in Recipes and tagged sausage on December 2, 2018 by The Yellow Pine Times. Heat a skillet over medium-high heat and add half a tablespoon of oil. Cook the sausages until they are nicely browned on all sides and set aside. Reduce the heat under the skillet to medium low and add the rest of the oil. Add the peppers and onion and cook, stirring occasionally, until they are nicely browned and tender, about 15 minutes. Add the garlic and pepper flakes, cook 30 seconds and add the canned tomatoes. Season the sauce to taste with salt and pepper, and add the sausages back to the pan. Cook just long enough to warm through and serve. This entry was posted in Recipes and tagged sausage on November 4, 2018 by The Yellow Pine Times. Cut bread into 1-inch cubes and set aside. 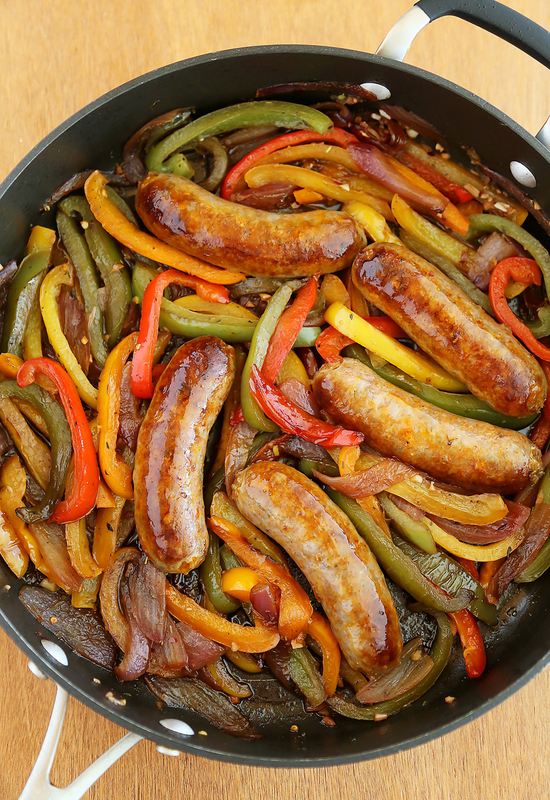 In a medium pan or skillet over medium heat, brown sausage until cooked through and no longer pink. Remove with a slotted spoon and set aside on a paper towel-lined plate. To the same pan, add diced onion and sauté until softened and translucent. 8-10 minutes. Add minced garlic to the onion during the last 2 minutes of cooking. Once fragrant, remove vegetables from heat and set aside. In a large bowl, beat together eggs with milk, mustard, salt and pepper. Assemble casserole by spreading bread cubes out in a 9×13-inch baking dish. Spoon sausage and onion mixtures on top of bread so that they fill in empty gaps. Pour egg mix on top of everything, cover and refrigerate overnight. 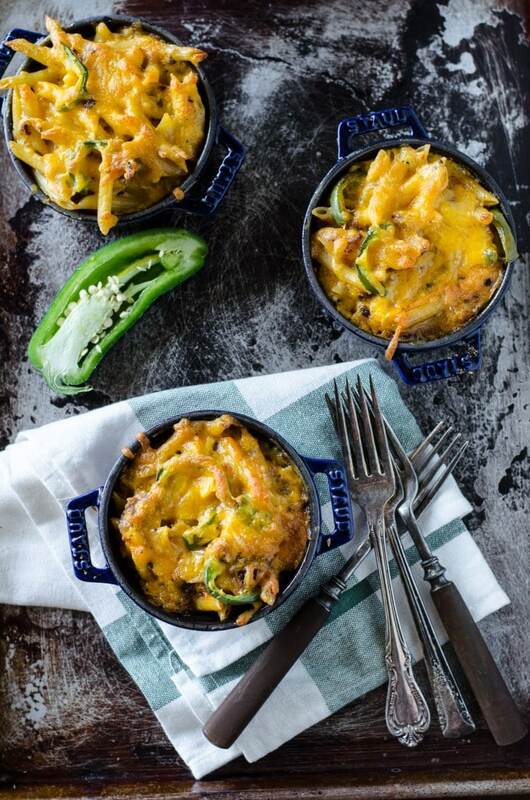 When ready, preheat oven to 350 F.
Take casserole out of refrigerator and sprinkle cheddar cheese evenly over the top. Bake for 45-50 minutes, or until cheese is melted and eggs are set. Remove from oven and let rest 10-15 minutes. Garnish with parsley and serve warm. This entry was posted in Recipes and tagged breakfast, eggs, sausage on October 28, 2018 by The Yellow Pine Times. 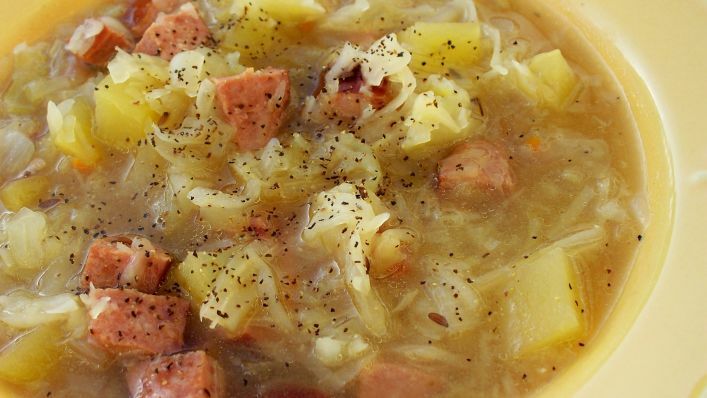 Place potatoes, cabbage, carrot, onion, caraway seeds, sausage, pepper and salt in crock pot. Pour broth over all. Cover, cook on low for 10 – 12 hours or high for 5 – 6 hours. This entry was posted in Recipes and tagged sausage, soup on July 8, 2018 by The Yellow Pine Times. Bring a pot of salted water to a boil. Add pasta; cook until al dente. Drain and return to pot. Heat a small skillet over medium high heat. Add the chorizo and hot sausage to the skillet. Break up into small pieces and cook until brown. Add the half and half, Velveeta, 1 cup of the sharp cheddar and ½ cup of the mild cheddar to the pasta. Stir together, then fold in the cooked sausage and jalepenos. Spray a shallow serving dish (sized approximately 13 x 9) with nonstick cooking spray. Pour in the macaroni mixture and top with remaining cheese. Bake in preheated oven for 35 minutes. This entry was posted in Recipes and tagged pasta, sausage on June 10, 2018 by The Yellow Pine Times.